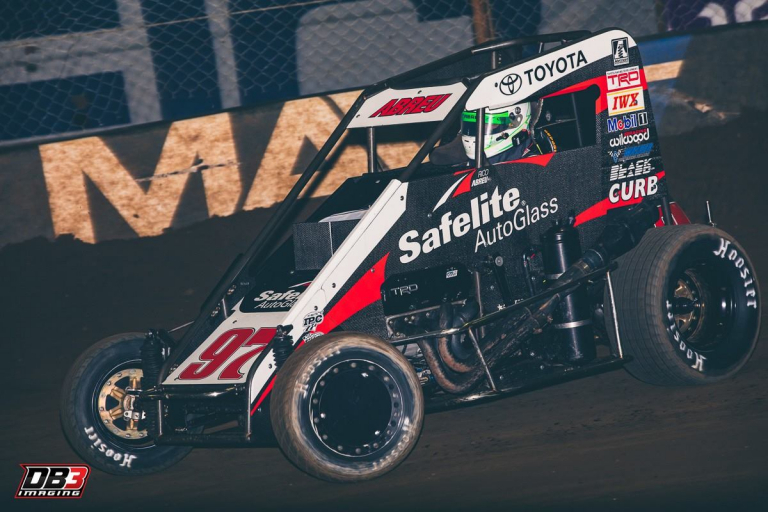 Bryan Hulbert – TULSA, Okla. (January 16, 2019) Rico Abreu was the class of the field in Wednesday’s Hard Rock Hotel and Casino Tulsa Qualifying Night at the 33rd annual Lucas Oil Chili Bowl Nationals presented by General Tire; winning for the fourth time since 2015 aboard the Safelite AutoGlass/Keith Kunz Motorsports No. 97. View full 2019 Chili Bowl Nationals race results below. Rolling to the green from the right of the front row, Abreu gave chase from third the opening pair of laps before working past Blake Hahn for second. Caution on Lap 3 for Matt Westfall who came to a stop in turn one, Rico worked the hub of the Tulsa Expo Raceway on the restart with the move for the lead coming on Lap 7. With a run off the bottom of the second turn, Rico secured the point with the slide through turn four. Slowed again on the ninth circuit when Alex Bright and Sammy Swindell tangled, Abreu pulled away on the restart as the race for second went three deep as Bodine, Gravel, and McCreadie traded top to bottom for the runner-up spot with David Gravel wheeling the FMR/Mobil 1 No. 76g to second. Holding off David Gravel on a Lap 14 restart, Rico quickly rolled away on the cushion. Picking up steam on the berm of the Tulsa Expo Raceway, Gravel closed the gap until Rico adjusted his line to the bottom of three and four while running the top of turns one and two. Putting time between himself and the No. 76g, traffic entered the picture just at Abreu found the back of the field. Unphased by the backmarkers, the man with the mullet crossed the stripe 1.794 seconds to the good. Locking into his first career championship feature event, David Gravel in second was trailed by Cole Bodine who held off the challenge of 17th starting Jake Swanson in the closing laps. Able to keep his No. 08 ahead of Tim McCreadie, the top five rounded out with Chili Bowl Rookie, Cannon McIntosh. McCreadie would settle for sixth with Colby Copeland seventh. Having to race out of a B-Feature, Ryan Smith was the night’s Hard Charger with a run from 23rd to eighth. Robert Dalby from 15th grabbed ninth with Daniel Robinson making it three drivers in the top-ten to advance 10 positions or more. Tulsa Expo Raceway – Tulsa, Okla.
Heat Races: Top 40 in passing points advance to Qualifiers. Heat 4 (8 Laps): 1. 57C-Cole Bodine, ; 2. 68W-Jake Swanson, ; 3. 08-Cannon McIntosh, ; 4. 3W-Brandon Waelti, ; 5. 57D-Daniel Robinson, ; 6. 52K-John Dyson, ; 7. (DNF) 9P-Tom Harris, ; (DQ) 2J-J.J. Yeley, ***No. 2J, Yeley, Disqualified for not allowing officials to tech fuel. C-Features: Top 4 advance to corresponding B-Feature. Qualifiers: Top 16 in combined passing points advance to the A-Feature. B-Features: Top 4 advance to the A-Feature. A-Feature: Top 2 advance to Saturday’s A-Feature. With three nights of competition in the books, the 33rd annual Lucas Oil Chili Bowl Nationals presented by General Tire, 204 drivers have checked in so far with 73 taking part in Wednesday’s Hard Rock Hotel and Casino Tulsa Qualifying Night. Currently, the Chili Bowl Flip Count standing at 22. All drivers have been able to walk away. The 33rd Lucas Oil Chili Bowl Nationals presented by General Tire continues Thursday, January 17, 2019, with John Christner Trucking Qualifying Night. A roster of 75 drivers is expected to be on hand for the Thursday affair. The River Spirit Expo Center will open at 9:00 A.M. with Pit Pass sales starting at 11:00 A.M. Hot Laps will get underway at 4:00 P.M. with racing at 5:00 P.M. (CT). A field of 74 drivers is expected to take to the track. For continued updates on the Lucas Oil Chili Bowl Nationals presented by General Tire, fans can follow along on Facebook, Twitter, and Instagram with @CBNationals. All official press, updates, and results on the Lucas Oil Chili Bowl Nationals presented by General Tire can be found online at http://www.chilibowl.com.